We received a friendly welcome on our arrival and were very pleased with our room at the back of the building. It was very quiet, spacious and clean. The breakfast was very good. Our only issue was with the breakfast service. We were ignored by at least 3 staff for over 10minutes and watched as other guests who arrived after us were greeted and served straight away. In the end I got up to get a menu myself and asked for a pot of tea. The next day we just asked for service straight away as the staff passed by. The third morning the staff were tripping over themselves to serve us. Overall though we enjoyed our stay and would stay again. Thanks to the cheerful gardener and reception staff! When we arrived, my wife didn't want to stay due to the outside appearance that appeared as if the place was abandoned. But once inside we were positively surprised by the layout, nice furniture and great breakfasts. Good place to stay. But the owner should dress up some things like flower arrangements remove the rotten ones from last year at least, windows a.o. A hidden gem in the heart of a city. Beautifully decorated with plenty of light, it truly was a home away from home. The staff were incredibly friendly and warm, the beds were so comfy we wanted to steal the mattresses, and the bathroom had a power shower so good it was like getting a Swedish back massage every morning! The breakfast menu was varied and delicious, the staff even provided Soy milk for my daughter. We will be staying here whenever in Killarney and would recommend it to anyone. We expected a small B&B but it has more the character of a hotel. However, the staff was extremely friendly and helpful. The room was spacious and clean, breakfast was also very good. Absolutely nothing to complain. We would definitely stay there again. Exceeded our expectations! Lovely, warm, elegant feel from the moment we walked in. Spacious, immaculate and we'll appointed room. Lots of privacy. Appreciated having our own key so as not to bother when coming in and out. Delicious breakfast with many choices in very nice environment. Bright, comfortable and inviting front room available to relax in or plan your sightseeing. Absolutely will stay here on our next visit to Killarney. Selected this lodge after reading reviews on tripadvisor and they were so true. Fabulous location close to town. Lovely bed and breakfast, helpful and courteous staff. Breakfast were fantastic three days we were there. Enjoyed the full Irish as well as the pancakes and waffles. Would highly recommend the place and would certainly return. Great service, location, room, meal! Lovely accommodation with friendly hostess. The room was large and comfortable. Breakfast had several options with very good food. The location was great for walking to shops and pubs. Price appears doubled for new years night. Their normal price would put it in the very good category. The hostess was very friendly and helpful. The room was very good. TV had very few channels and set was dated this would have made for a rather boring stay during bad weather. I would definitely stay at this place again and highly recommend it. Great location, quiet, clean, pleasant rooms and helpful staff. Quaint place, kind of in between a B&B and hotel...room was nice, with a real bathtub. Price was OK for the location, right on the main road into Killarney National Park, close enough to walk into town for shopping or pubbing, the tours picked me up. The management was very nice and attentive. My stomach was on strike, so I didn't eat there, but everything looked good. 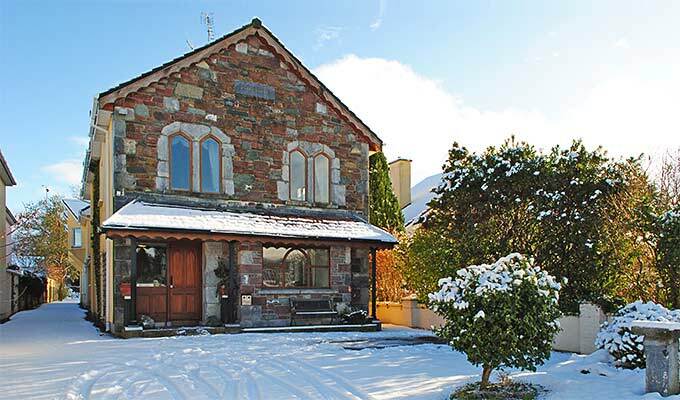 Excellent location, perfect for a weekend break in Killarney. B&B perfectly located, everything went very well, we appreciate a lot our stay there. Staying here was a joy! I enjoyed having a key to the front door so that I could come and go easily, and the house itself was lovely. We all enjoyed the breakfast in the morning, and I would definitely stay here again. 15 Jahre Gast in der Abbey Lodge - every year. KY and the Abbey Lodge its a good and frendly place for holyday. Thank you for John and her Staff! Room was very nice. Hospitality was lacking. Girl that met us upon check in had the personality of a rock. Went down to find coffee in the morning. The same girl was working. I asked where I could get some coffee. She just walked away. The only cups I saw were on the pre-set tables so I used those. She later seemed upset that the tables were messed up. If you had a morning coffee service set up this wouldn't happen. Breakfast was good. Over all a nice place just a little short on friendliness and hospitality. Really enjoyed our stay. Room was comfortable and quiet, near to the centre of town. The bathroom was a bit small, and the shower head was located inconveniently. Apart from that, would reccommend and would stay again. chambre confortable et bien située. lovely staff made our visit even more enjoyable. We had a lovely stay and I really do love the rooms and furnishings of the house! We stayed at the Abbey Lodge for 14 days and absolutely loved every minute of it. The owner, John, and his entire staff was incredibly friendly and accommodating in every way we could have asked. They let us use their landline to contact various business in our area and were always readily available to answer questions we had. They offered us fresh towels and other essentials as well as room tidying every day and brought up ice and such extras when we asked. The breakfasts in the morning were at a perfect time for a young couple on vacation; not too early and not too late 8-9:30! The food was also delicious and something to look forward to every morning, with a great variety at the breakfast bar as well as 5 different items to choose from to have cooked-to-order. Our room was clean upon arrival and a decent size for two, with a modern bathroom that I absolutely loved. We had our sheets changed whenever they cleaned, which could have been every day had we requested it. John was a pleasure to do business with, as he was flexible with a booking issue that we had, incredibly reasonable with his prices, and always checking in to make sure we were enjoying our stay. We received a key to the house which is customary I believe, as well as our room so that we could come an go as we pleased; also a great thing for a young couple. In addition to the wonderful service at the Abbey Lodge, the location could not have been better. We were just far enough outside the heart of Killarney that the number of people weren't totally overwhelming when one stepped outside, but also a mere five minute walk straight into the heart of Killarney that was very convenient. Killarney National Park, a beautiful and serene escape, was nearly at our doorstep and even closer than the city. The ability to get lost in either the bustle of the city or the peacefulness of the Park was unparalleled and couldn't have been any better. There is also a liquor store and convenience store on the same block and across the street, which was very convenient for us. This was our first time in Ireland and though we plan to see the rest of Ireland, we fully intend to spend as much time at the Abbey Lodge as we can in the coming getaways. With a vey ling-winded explanation, we absolutely recommend one stays at the Abbey Lodge without any further consideration. Very clean and everyone very accommodating and friendly. Beautiful house, friendly staff. Cost is a little high but I would go again because I liked it a lot! The Abbey Lodge is in a great location on the main road and just a short walk from the center of town. The price is great for what you get. I wasn't impressed with the service as we weren't greeted very welcomely upon arrival. The internet didn't work in the rooms and we had to stick to one location in the main room in order to get service. The bathroom soaps could use some updating as ours barely squeezed any soap from the walls. They also stated laundry was going to be available but what was offered to us is a laundromat just a short walk away that you can pay for. The prices of the laundromat were reasonable and it only took one day.